The Tucson N Line gets sportier styling as well as updated suspension and steering. Last year, Hyundai launched its new N Line range to slot below its full-fat N Performance models. Think of it as Hyundai’s equivalent to BMW’s M Line and full-fat M performance models. Currently, the only N Line model sold in the US is the , while the . Joining the European range is the Tucson N Line, the first SUV to receive the N Line treatment. Sporty styling tweaks distinguish the Tucson N Line from the standard model. The front gets redesigned bumpers, revised LED daytime running lights, a dark chrome front grille, and black bezels around the headlights. Hyundai has also implemented black window surrounds and body colored door handles and the sporty SUV rides on dark 19-inch alloy wheels. Other exterior add-ons include a black rear spoiler, black roof, and black wing mirror caps. Inside, the sporty Tucson gets N-branded leather-suede sport seats and red accent stitching on the steering wheel and seats. Other interior enhancements include alloy pedals and a leather-wrapped, red-accented N gear shift lever. Being an N-Line model means there are no performance enhancements, but reports have suggested a . Three powertrain options will be available in Europe, including a 2.0-liter CRDi 48V mild hybrid engine with 182 hp, turbocharged 1.6-liter T-GDI gasoline engine with 174 hp, and a 1.6-liter CRDi diesel engine that combines the 48V mild hybrid technology of the 2.0-liter model. These powertrains can be optioned with a two-wheel drive or four-wheel drive system and mated with either a six-speed manual gearbox or seven-speed dual-clutch transmission. 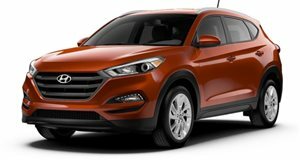 The Hyundai Tucson N Line will be available in Europe and be offered in nine different colors. Sadly, a Hyundai spokesperson confirmed there are currently no plans for a US launch.